Never run out of ammunition in the field again while wearing the M4/M16 6 Mag Drop-Leg Shingle from Voodoo Tactical. 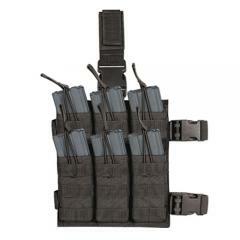 Designed to offer convenient access to extra magazines, the shingle features a tactical pouch layout that allows for speedy retrieval of six M4/M16 magazines. The drop-leg design features a sturdy belt strap and two adjustable thigh straps for secure attachment to the body through intense physical activity that doesn't hinder movement. Bungee cords provide additional magazine retention, ensuring contents are held firmly in place. A quick-release buckle provides rapid deployment and speedy on/off wear. External, universal webbing guarantees secure attachment of additional MOLLE-compatible gear for an ultimate carry companion. Love it havent really used it yet but love it.